Sometimes my brain goes on adventures. So if you catch my body buying dog food on a Tuesday, my mind might be treasure-hunting with pirates on a Saturday. (They say pirates live for the weekends.) Or I might be busy pondering up my dream home or dream career or dream era to live in. And then yesterday it hit me: When I grow up, I'd like to be a Disneyland duck. 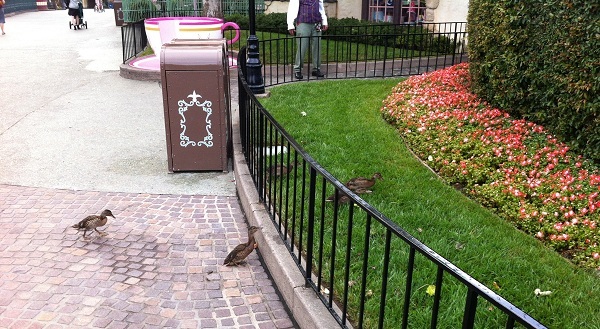 Just think, ducks have the entire park laid out before them - magical lands, free food, robot trash cans. And they can people-watch to their hearts' content. So to experience the wild west, the place to be is Thunder Mountain's copper-colored pond. But once they've had it with all the coins thrown at them, it's off to the Pooh ride for that hundred-acre-wood vibe. Or to Sleeping Beauty's castle to swim with the swans (say five times real fast). And they have a choice in the matter, too. They know the grass isn't greener on the other side of the fence. Disneyland stops at the fence. They've flown around town and checked; I'm sure of it. So it was my 15-year-old and I who figured all this out as we watched little ducklings cozy-up to their momma near the Tiki Room. We think alike. However, while I'm jealous of the ducks, my daughter will focus more on Mary Poppins as she passes by, and sigh, "If only I lived in that time period and talked like that, dressed like that, danced like that." And being the amazing mother I am (amazing usually happens when I'm about to eat ice cream at Disneyland), I told her, "God has your time planned for you here. And now. Not in 19th-century England, but in 2012. Living in Orange County, California. At Disneyland with your family. Today. In your cute jean shorts (that may be a tad too short)." Okay, okay. Actually, the first thing I said to her was, "People died from awful diseases back then. No Internet. Bad teeth." But the second thing I said was pretty good, I thought. Especially since it wasn't even my idea. Acts 17:26 says, "From one man he made every nation of men, that they should inhabit the whole earth; and he determined the times set for them and the exact places where they should live." What a concept! So just when dreams of found pirate booty (which they stole from someone, but that's a story for another day) take up too much brain power, I tell myself, "Now now, Miss Molly, we'll have none of that. You were meant for where you are now." And that makes me one lucky duck.